Cimarron-Memorial High School is a public high school in Las Vegas, Nevada and part of the Clark County School District. Edward Matthew Drummond is a former American football wide receiver and return specialist. He was signed by the Detroit Lions as an undrafted free agent in 2002. He played college football at Penn State. Teddy Lehman is an American former college and professional football player who was a linebacker in the National Football League (NFL) for seven seasons. He played college football for the University of Oklahoma, and was twice recognized as a consensus All-American. The Detroit Lions chose him in the second round of the 2004 NFL Draft, and he also played for the Buffalo Bills and Jacksonville Jaguars of the NFL, and the Las Vegas Locomotives of the United Football League (UFL). Tracy G. "Trace" Gallagher is an American journalist and television news anchor for Fox News Channel. Martin John Bibla is a former American football guard. He was drafted by the Atlanta Falcons in the fourth round of the 2002 NFL Draft. He played college football at the University of Miami. Jason Curtis Fox is an American football offensive tackle who is currently a free agent. He was drafted by the Detroit Lions in the fourth round of the 2010 NFL Draft. He played college football at the University of Miami. Melvin Thaddeus Fowler, Jr. is a former American football center. He was drafted by the Cleveland Browns in the third round of the 2002 NFL Draft. He played college football at Maryland. John Christopher Madsen is a former American football tight end. He was signed by the Oakland Raiders as an undrafted free agent in 2006. He played college football at Utah. Copeland Bryan is a former gridiron football defensive end who played professionally from 2006 to 2014. Bryan signed with the Tennessee Titans as an undrafted free agent in 2006, and played in games for the NFL's Buffalo Bills and Detroit Lions. He ended his playing career with the Las Vegas Locomotives and Montreal Alouettes. Jason Fife is a former American football quarterback. He was originally signed as a free agent by the Detroit Lions in 2004. He played college football at Oregon. Frank Davis is a former gridiron football guard. He was signed by the Detroit Lions as an undrafted free agent in 2006. He played college football for the South Florida Bulls. Kurt Keola Gouveia is a former professional American football linebacker who played 13 seasons in the National Football League and one season in the XFL. During his career, he played for the Washington Redskins, the Philadelphia Eagles (1995), and the San Diego Chargers (1996–1998). In 2001, he also played for the Las Vegas Outlaws in the now-defunct XFL. Matthew Shepard is an American television play-by-play announcer for the Detroit Tigers on Fox Sports Detroit. He has also covered professional, collegiate and high school sports in the Metro Detroit area since the 1990s. William Franklin is a former American football wide receiver. He was drafted by the Kansas City Chiefs in the fourth round of the 2008 NFL Draft. He played college football at Missouri. 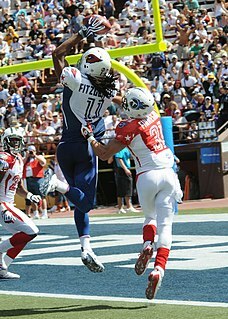 Kevin Scott is a former professional American football cornerback in the National Football League. He played four seasons for the Detroit Lions. He attended Stanford University where he was an All-Pac 10 1st team selection as a Defensive Back. He was chosen by the Detroit Lions with the 91st pick in the 4th rd. He played 4 seasons with the Lions. His career included stops in Denver,Chicago, NFL Europe-Scotland Claymores,XFL-Las Vegas Outlaws,AFL-Detroit Fury and CFL-Toronto Argonauts. Evan Blake Smith is an American football center for the Tampa Bay Buccaneers of the National Football League (NFL). He has also played for the Green Bay Packers and Seattle Seahawks. As a member of the Packers, he won Super Bowl XLV against the Pittsburgh Steelers. He played college football at Idaho State University. Mikel Leshoure is a former American football running back. He was drafted by the Detroit Lions in the second round of the 2011 NFL Draft. He played college football at Illinois. Jon Blackman is a former professional American football player. In college, he played tight end at Purdue. He has been a member of the Detroit Lions, Indianapolis Colts, Philadelphia Eagles, and the Las Vegas Outlaws of the XFL. He is a proud father of two girls. Taylor Decker is an American football offensive tackle for the Detroit Lions of the National Football League (NFL). He played college football at Ohio State.